News from Guided Therapy Systems, Cerenovus, REVA Medical, and 7D Surgical. Guided Therapy Systems’ Actisound intense therapeutic ultrasound works as an invisible scalpel, delivering small, thermal ablations beneath the skin to soft tissue – at the point of injury, up to 15mm deep without the need for surgery – promoting collagen growth and regenerating connective tissue. Cerenovus’ Bravo Flow Diverter is approved for treatment of intracranial aneurysms. The device diverts blood flow from the aneurysm and promotes healing, reducing the risk of rupture. Early evaluations are scheduled across Europe ahead of European commercialization. The device is not approved for use in the U.S.
REVA Medical’s MOTIV is the first drug-eluting bioresorbable scaffold to receive CE Mark approval for treatment of below-the-knee peripheral artery disease. MOTIV is made from REVA’s vascular polymer scaffold Tyrocore. Radiopaque, MOTIV is visible under X-ray, helping ensure accurate placement in the artery. 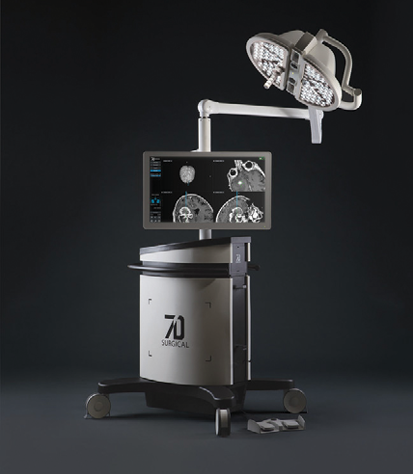 7DSurgical received 510(k) clearance from the U.S. Food and Drug Administration (FDA) for its Cranial Module of the Machine-vision Image Guided Surgery (MvIGS) system for cranial surgery. The system uses camera-based technology and machine vision algorithms to eliminate long-standing frustrations with legacy surgical navigational platforms. Using a contactless workflow, MvIGS acquires hundreds of thousands of virtual fiducials using the patient’s anatomy, resulting in nearly instantaneous cranial registration in almost any surgical position. The Cranial Module can also register multiple datasets independently to the intra-operatively acquired Flashä regis- tration, allowing surgeons to visualize the anatomy on the fly.